Britain's rail passengers will see a 1.1% rise in average fares from 2 January, 2016, the Rail Delivery Group (RDG) has announced. Regulated fares, which include season tickets, are capped at no more than July's RPI inflation rate of 1%. Unregulated fares, such as off-peak leisure tickets, can go up by as much as the train companies like. RDG chief Paul Plummer said: "We know that nobody likes to pay more to travel by train, especially to get to work." But he added that money from fares now almost covers rail's daily operating costs. "This allows government to focus its funding on building a bigger, better network when the railway is becoming increasingly important at driving economic growth, underpinning jobs, and connecting friends and families," Mr Plummer said. Under government rules, the rise in regulated fares was restricted to no more than the Retail Prices Index measure of inflation over the year to July, which was 1%. Over the long term, RPI has tended to record higher inflation than the other measure of rising prices, the Consumer Price Index, which was 0.1% during the year. 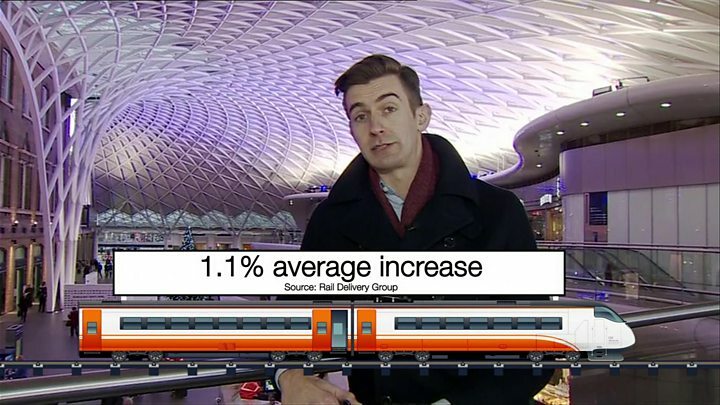 Martin Abrams, of the Campaign for Better Transport, said more must be done to achieve a "truly affordable railway" as fares have risen by more than 25% in the last five years. "To avoid pricing people off the railways, the train operating companies and the government need to work closely together to provide fairer, simpler and cheaper fares through flexible ticketing and making sure people are always sold the cheapest ticket available." Mr Abrams insisted it was "simply unfair" that flexible ticketing has not yet been introduced, leading many part-time workers to "fork out for five-day season tickets which don't give them the same savings that full-time commuters get". Rail Minister Claire Perry claimed the government's decision to link regulated fare increases to no more than RPI will save the average season ticket holder £425 by 2020. She added: "Our plan for passengers is improving journeys for everyone. It's transforming the tickets people buy, how much they pay for them, the trains they sit on, how quickly they arrive and the stations they arrive in." But Mick Cash, general secretary of the Rail, Maritime and Transport union, said the rise was "another kick in the teeth for the British passenger who is already paying some of the highest fares in Europe to travel on clapped out and overcrowded trains". The increase would help ring-fence the profits of "rip-off private rail companies who, once again, will be laughing all the way to the bank". Today's rise is the smallest since 2010 and even that was a one-off blip before an election. Regulated fares have actually raced up by around 40% in the past decade, taking season tickets around the south east of England well into the £4,000-£5,000 mark. The whole point of letting the government regulate half our fares was to protect customers from big hikes by the train companies. They picked out the kind of tickets where people don't have much choice but to go by train. Like commuting into big cities. This is the third year now that fare rises have been limited to inflation and they'll be kept there for the rest of this parliament. But it comes after years of stinging rises.